If you would like to link up I would love for you to grab the badge below and spread a little linky love to some of the others taking part, and don't forget to spread the word, invite lots of people and help me grow this and make Thursdays a happier place. This week I'm giving Thanks for my children, it goes without saying that I'm grateful for my babies, but I just want to say it here, my kids make me laugh every day, I love how kind and smart and funny they are, and even on the hardest most sleep deprived, stressful, busy frantic day... They always give me something to smile about. 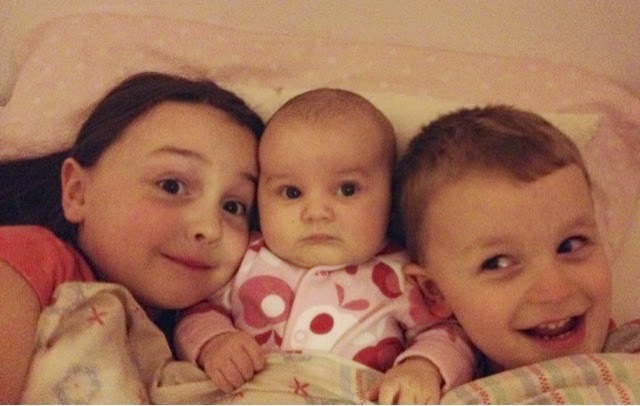 A lovely picture of three little cuties. You're so right though, my little boy is my world, even at his naughtiest.